Awwww Fridays. How much do I love thee? Let me count the ways. You beautifully segue into the weekend, you give me an extra pep in my step and it’s also “treat Friday.” Every Friday at my workplace, someone on staff is in charge of bringing in treats for all to enjoy. 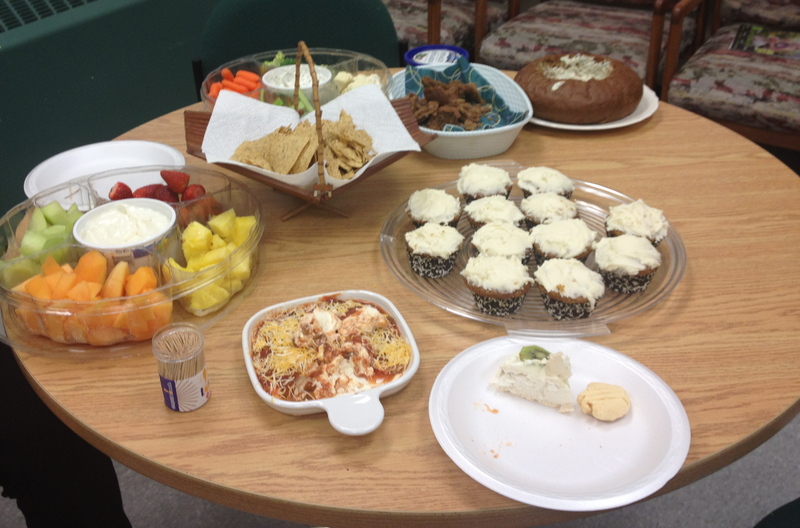 It’s usually quite a spread, and folks go all out preparing a delicious variety of snacks galore. I always look forward to treat day, but have to be mindful of my selection. Although there are fruit and veggie trays, there are usually cookies, cakes, pastries and other baked goods to choose from as well. A lot of the bake goods are often made from scratch. Just so yummy! Because I am trying to manage my weight, I have come up with a system on treat Friday. I have noticed two ladies who NEVER eat the decadent treats and will only opt for the fruit and veggie tray. I, on the other hand, am not that strong. I will take an abundance of fruits and vegetables, however, I will allow myself to have perhaps one cookie or a tiny taste of decadent dip with a cracker. If cake is a treat option, I may have just a sliver. It seems after I get enough natural sugar from the fruit selection, such as pineapple chunks or grapes, I don’t feel a strong need for the baked goods. Does anyone have treat day at their jobs? What strategies do you use if managing your weight?